Home Nails The Most Festive Halloween Nail Polish For Everyone! Halloween is right around the corner! A lot of people don’t have anywhere to go and may not have a reason to dress up. But if you want to show off just how festive you are, you can always get your nails done instead! There are so many different ideas so you can be as cute or as spooky as you want when picking out Halloween nail polish! The best part is the fact that you have an excuse to get acrylic nails if you want an intricate design. 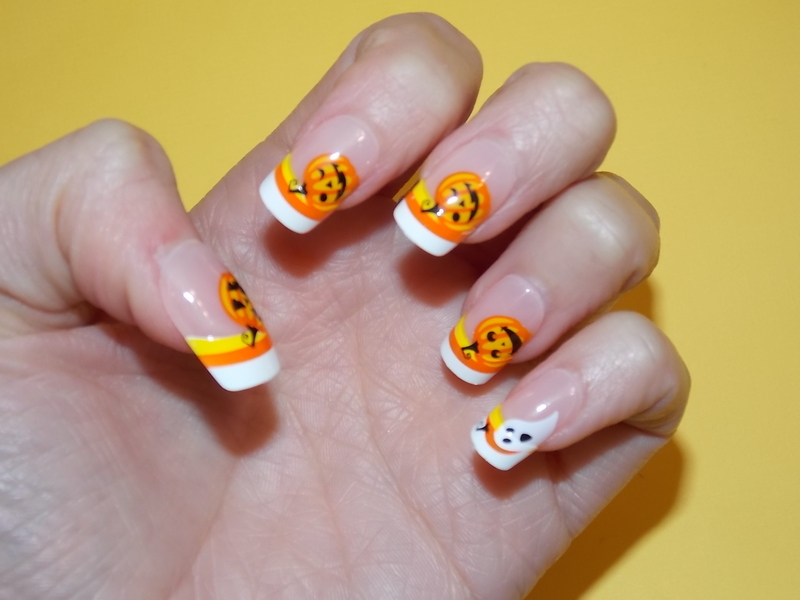 But there are plenty of easy Halloween nail designs for short nails too. It just comes down to what you’re in the mood for! I want to give you the rundown of different lengths, styles, designs, and manicure options. They can all be achieved at home, at the salon, with nail polish, or with nail wraps. After all, everyone can use a little bit of variety. I also thought it might be a little easier to help you find your favorite holiday nail designs for this spooky season if you have more options to choose from! There are plenty of cute designs to choose from if you aren’t in love with the horror aspect of Halloween as much as some people. There’s no reason that you have to focus on the scary stuff. I completely understand that many people work with kids and want to get in the spirit of the season, without advertising the scary details. Cute nail designs are perfect for moms, teachers, daycare workers, and more. You could opt for simple Halloween nail polish colors. Easy nail art designs, like this black and orange one, are the simplest to pull off and are so classy! They would be a fantastic option for anyone who wants to pull off a cute Halloween look from home. Other cute designs could include ghosts or other Halloween characters. A variation on french tips would also make cute and easy DIY nail art! Some of you might already like gothic nails on your own time. They can be a fierce and classic look, even without our favorite spooky holiday right around the bend. Matte black nails and other black nail designs look incredible when they’re tapered down to a point. 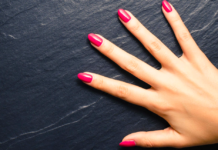 This nail shape is called a stiletto, and it never seems to fall out of style. I can’t say that I will be taking part in this trend. Mainly because I can’t imagine trying to put my contacts in with weapons on my fingertips! You obviously could spice things up a little too. It isn’t necessary to choose black nail art because it’s Halloween. You could do some fierce red vampire nails. 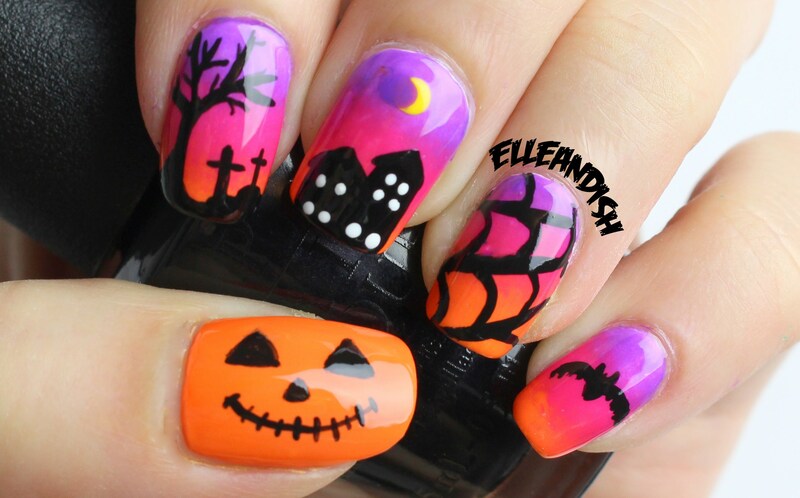 Or try one of many incredible nail designs, both cute or spooky. Like candy corns or skull nail art! All you really have to do is get creative and try new things. The simpler the design, the easier it will be to pull off! Even if you don’t intend to do DIY nails this time, have some mercy on your nail tech. I know it can be harder to pull off cute Halloween nails when you have short nails. When I was younger, I used to bite my nails regularly. It has been years since I’ve bitten my nails, but to this day, they never seem to get much longer. Luckily, I came to terms with my short nails long ago. But when Halloween nail polish comes into the picture, I feel like the only thing I can do is pick a simple color to match the season. It isn’t like they are long enough to be able to paint any cute designs on my nails. 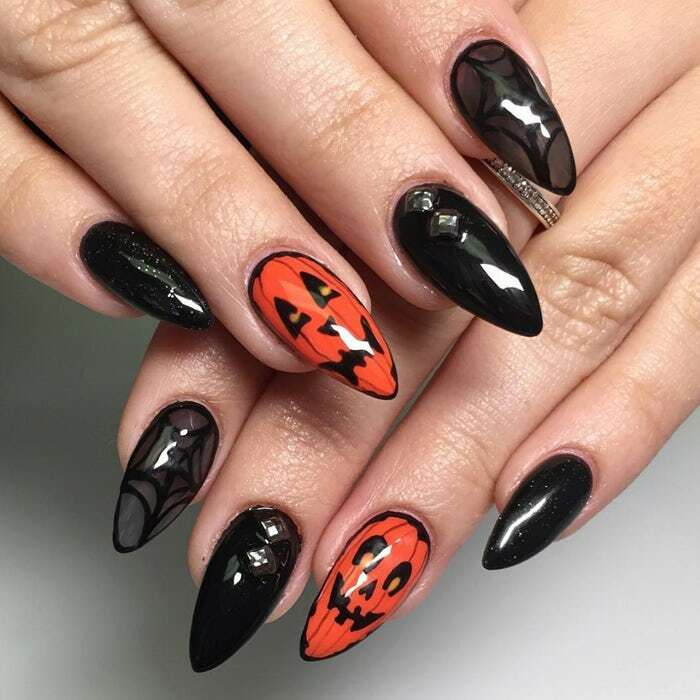 Halloween acrylic nails are another option if you have short nails, but I also tend to avoid this option. Acrylics do some severe damage to my nails. As soon as they come off, my nails are paper thin for what feels weeks. But I still love the look of them and get them for special occasions, so who knows, I will probably cave sooner or later and get Halloween acrylic nails after all. I’m not sure if you’ve heard of this popular new item, but nail wraps are a fantastic option for anyone with short nails. If you want cute Halloween nail polish and feel like your nails aren’t long enough to make a design, these are a great alternative. They can be an excellent idea for people with long nails too because it cuts out the hassle of trying to create something. The design is already on, and you only need to apply it like a sticker! Jamberry has been making nail polish strips very popular, and they have a few cute holiday designs of their own. Jamberry is much better for those of you who fall into the cute Halloween nail polish category. They have designs like cartoon ghosts or spiders or cartoon skull designs. Zazzle is another website that also sells Halloween nail polish strips. 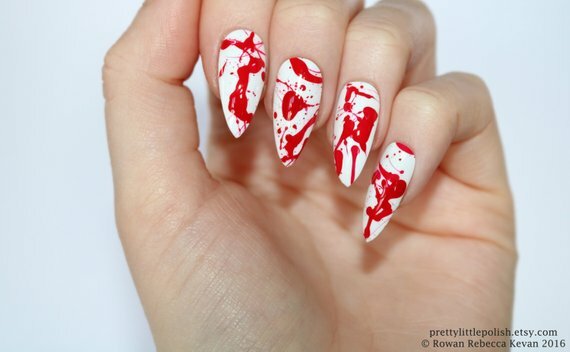 They fall into a spookier category with dripping blood or creepier versions of the skulls nail design. I have never used nail wraps personally, but I think it would be something to look into. Especially for us short nailed girls. It can be a struggle just painting our nails. Let alone creating a design, believe me, I certainly used to try! The best option when learning how to use nail polish strips would be to learn from a step by step tutorial for any specific brand. They may all have a different technique for their nail are tutorials so watch out for that! 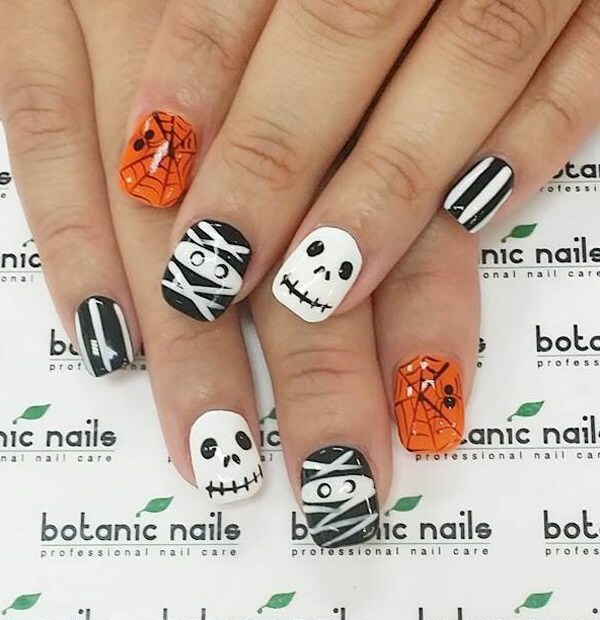 Have Fun with Halloween Nails! There are so many different options when it comes to Halloween nail polish. I suppose it comes down to what you like the most! If you’re trying to get into the spirit, you could choose anything from Halloween glitter nail polish, Halloween french tips, creepy nail designs, or cute little pumpkin nail art. It depends on what you’re in the mood for this holiday season. You could even pick something that will go with your costume if you happen to be dressing up. 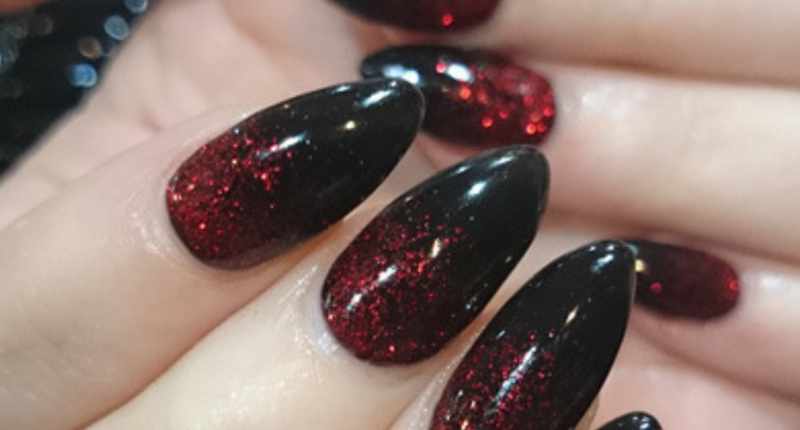 Such as red pointy vampire nails or matte black nail designs for a creepy witch. No matter what you decide on, have fun with it! If acrylic nails aren’t your thing, you could easily find alternative designs for short nails. Like pumpkins, ghosts, nail wraps, and more! Don’t feel like you need to be limited by the length of your nails. Choose what works best for you, have fun, and Happy Halloween!